The essays in this collection suggest the similar, and also strikingly dissimilar, strategies of women working within medieval courtly cultures to mitigate traditional patriarchal constraints. Many of the works and authors focus on the courtly aspects of medieval European and Heian culture in which art, literature, and love are the highest pursuits. For both, living is itself art. It supplies instructors and students of world literature, women's studies, and medieval literature with essential, useful analysis in an area that previously has been the territory of specialists. ..."provides new, thought-provoking perspectives and can be read fruitfully by those interested in literature in general and women's studies in particular." --"Choice"
.,. "provides new, thought-provoking perspectives and can be read fruitfully by those interested in literature in general and women's studies in particular." --"Choice"
. "..provides new, thought-provoking perspectives and can be read fruitfully by those interested in literature in general and women's studies in particular." --"Choice"
..".provides new, thought-provoking perspectives and can be read fruitfully by those interested in literature in general and women's studies in particular." --"Choice"
Barbara Stevenson is Professor of English at Kennesaw State University. Cynthia Ho is Associate Professor of Literature at the University of North Carolina, Asheville. 5. 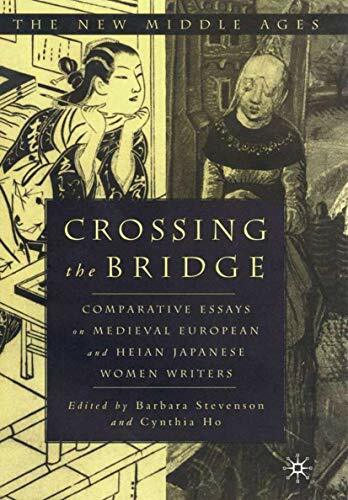 Crossing the Bridge: Comparative Essays on Medieval European and Heian Japanese Women Writers (The New Middle Ages) [Hardcover] Stevenson, Barbara and Ho, Cynthia O.